If the customers want to leave more money on the table, then why is the industry allowing them to walk out the door? Your last customer may have easily earned you a million. Perhaps even two. But the chance passed you by all because you didn’t care. Restaurants are guilty of letting profitable opportunities walk out the door. And it is because there’s a lack of good service. Seventy percent of customers do not know what they will order when they go to an F&B establishment. That is a 70 percent chance of getting an extra P100 to P200 per person in added sales. The average small café would have 10 occupied tables per meal period and two meal periods per day. Let’s say that each table has three customers on it, making that 60 customers in total for the two meal periods. If the staff could get each customer to just spend an extra P100 each over a 360-day year (allow five days of closure) that would amount to an extra P2.1 million in revenue. How to go about it? Simple. Provide service and make sure your team has the tools (knowledge) to enhance your customers’ experience. If you can develop a culture in your team where all your employees are engaged and are service-minded then this should be easy. It is what we call in the industry “suggestive selling.” Many will use the term upselling but, personally, I don’t like this word as it teaches your team to force a sale rather than listen, analyze, and suggest something to a customer that might enhance his experience. The best example to prove this is by referring to your most recent fast food chain visit. Every time you walk into a fast food restaurant, there is an 80 percent chance that you will be offered other items by the server. For example, an order of a burger meal will be followed by a recommendation of “Would you like to make it large fries and Coke?” If the customer asks how much, then they are trained to use the special word. “It’s only P50.” If you order a large meal, you will be offered a dessert to complement your order. If a 17-year-old can be taught to do this for every single transaction, then why can’t the F&B world in the Philippines? It irks me when people need to put their hands up to get the attention of the servers. And it is not because there is a lack of staff. Rather, there are too many staff members working but not taking responsibility for their jobs as they decide to hover around the cashier desk rather than focus on offering a second drink to a thirsty guest. The restaurant owners allow things like this to happen and slip away when they could have easily taken advantage of the situation by offering a second drink before the first is empty; by placing the next bottle of beer on ice for a purchase that’s going to be hard to deny; or by simply offering a small snack to go with your coffee. The problem is that when or if they are trained, we make our staff robotic rather than train them to know their products well enough to make the best suggestions with confidence. Last week, I sat in a prominent café and it took the staff 30 minutes after my first drink to come and offer a second. I ordered a sandwich that comes with no sides and they never bothered to ask if I wanted a small salad or fries to go with my sub (I would have happily paid an extra P100 for this side). They almost immediately placed tap water on my table without even offering bottled water or sparkling water. The ashtray on our table was never emptied (this is the perfect time for an employee to have an excuse to go to your table to check on what they could recommend while at the same time enhancing your experience by providing a service that makes you feel more comfortable and confident in their abilities). The Philippine industry needs to wake up. Customers need to demand more quality and not accept putting their hands up to get service, watching staff chatting when your glass is empty, or talking to staff who cannot answer basic questions about the menu because they have not been trained. Overall, I sat there for two hours working on my laptop and my bill was P460. I walked away and calculated that had I ordered a second drink, a small side dish, and a bottle of sparkling water, my bill would have been P720. If this establishment has just 20 people or 20 percent of customers like me per day (they average over 100 covers a day) then they would be making an extra P2 million every year without added expenses. The Philippine industry needs to wake up. 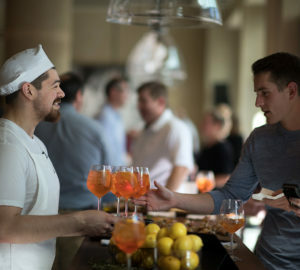 Customers need to demand more quality and not accept putting their hands up to get service, watching staff chatting when your glass is empty, or talking to staff who cannot answer basic questions about the menu because they have not been trained. Owners need to wake up and understand that millions of pesos are walking out their doors. Study the retail industry and learn from their techniques; study the international fast food companies who are the masters of getting you to spend an extra P50; but most importantly start putting service first and make it a priority. Filipinos are known to be very hospitable, but why doesn’t it translate in the restaurant? If only we provide the tools (training, culture, and mentorship) and stop having a pwede na attitude, then many restaurants will continue to flourish. Go and make the extra P2 million but remember to give back and spend 10 percent of the increased revenue on team building and team experiences. This will make the team culture evolve into something that will start making you P4 million through guest retention, brand recognition, and, ultimately, help you survive against the tide of competition. What makes an effective front desk agent?